Three-quarters of school districts in California report having a professional development plan to prepare teachers and administrators for the Common Core standards. And three out of four districts also said they’d have lessons in math and English on all of the Common Core standards in every grade in place a year from now. But as of the start of this school year, only one in five districts said teams of teachers actually had done lesson planning in Common Core in every grade. 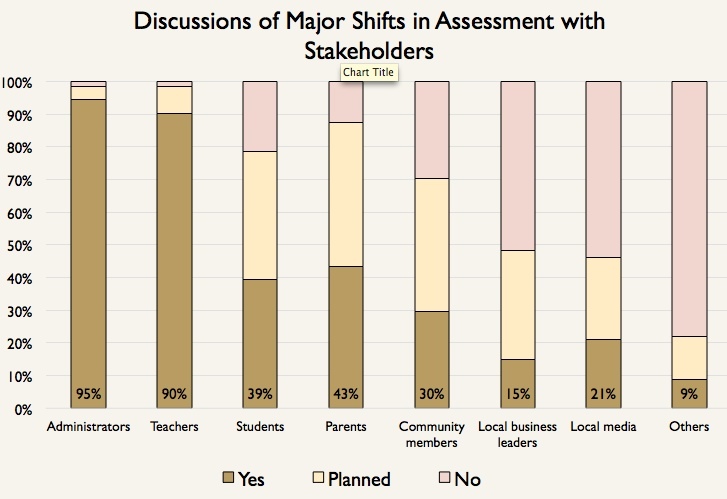 Most districts plan to explain the differences in Common Core assessments to parents and students but not to the news media or business leaders. Source: CCSESA survey of districts, 2013. With 18 months to go before the students begin taking official computer-based tests in the Common Core standards, the results show that districts overall are moving forward in a systematic fashion, although breakdowns by county, to be released later this fall, are expected to show great variations among counties and districts. All but two county offices participated in the survey. Nearly all districts reported they have a formal plan for implementing Common Core, and more than 80 percent of those contain the critical elements: development of a curriculum, professional development for staff, design of assessments used for instruction and integration of technology in instruction. Only a third of districts plan to purchase materials in English language arts in the next 18 months (for math, it’s closer to 60 percent). The reluctance reflects that fact that the state English language arts frameworks ­– an extensive guide to teaching the Common Core standards – won’t be approved by the State Board until next summer. That doesn’t mean that districts will be empty-handed; they can turn to other states and Internet sites for guidance and materials. But it will force them to do more cobbling together than they’d prefer. Most districts have not yet reached out to parents, community members, the local media and local businesses to explain Common Core standards or the big shift to computer-based assessments. Nor do they plan to. That could prove problematic if, as expected, districts run into problems next spring when districts administer field or preliminary Common Core tests by computer. Those tests also won’t produce scores for schools and individual students that parents expect to receive every year. A lesson from the Affordable Care Act is that web site glitches make headlines and give naysayers a platform. Most of the districts plan to spread their share of the $1.25 billion in state money for Common Core fairly evenly among technology, staff training and materials. Only 10 percent of districts indicated they’d spend 75 percent or more of their money on technology, while only 7 percent said they’d spend big a portion on professional development. Only 4 percent said they’d spend all or nearly all on materials. As this point, more districts have decided to switch to integrated Common Core math courses in high school (30 percent) than plan to continue with the traditional subject sequence of Algebra I, Geometry, Algebra II and Trigonometry/Pre-Calculus. However, 38 percent of districts have not made up their minds. On the much debated issue of if and when to accelerate math development to put students on the path for Calculus, the majority of districts (58 percent) either have not decided when students should skip ahead – eighth grade or high school – or if that option should be given. A quarter of districts will offer a compressed sixth and seventh grade Common Core math so that students are ready for Algebra I in 8th grade. The county superintendents association will present the findings to the State Board of Education at its meeting on Nov. 6 and 7. * The survey was prepared for the Consortium for the Implementation of the Common Core State Standards. Its members include the state State Board of Education, the state Department of Education, California County Superintendents Educational Services Association, California Teachers Association, Association of California School Administrators, California School Boards Association, California State PTA, Californians Together and California Charter Schools Association. In my experience before, during and after the push for 8th grade Algebra, the profile of students completing AP Calculus before HS graduation did not change. Same kids, same family profile. Even terrific programs like AVID did little to change the math progression at the top end. What did rise was the number of students forced to take Algebra before they were ready (developmentally or preparation-wise). We have hundreds of kids retaking Algebra 1 year after year after year in our district. Enrollment in alternative and credit recovery programs has skyrocketed. Anecdotally, as a parent during these years, I’ve seen an awful lot of bright kids utterly demoralized by the forced march into Camp Algebra before they were ready. There have been serious, very real, consequences for these kids and their families. Yet with all the good policy intentions, we saw very little impact on the number of students coming out the other end with an AP/Calculus grade on their transcript. I did some research. Barrons apparently defines 200 to 250 places as highly selective out of more than 4,000 institutions in the US. And the cited article says calculus is recommended but AP statistics and other strategies would work OK unless you want to major in engineering or something mathy. My high school has about 600 graduates a year. My (completely uninformed) guess is that about 15 of them have a shot at a highly selective school. So enough with the mania to push every kid into calculus. I think that mania ended with California’s decision to remove its policy of 8th graders taking algebra. I think the focus has shifted to making sure that Calculus is available for those students that are ready for it in high school. Absolutely agree with you Chris. Unless and until UC’s decide to no longer compete for high achieving local, domestic and international students, students with STEM aspirations need not apply if they are not able to take Algebra in 8th grade. Wow. Is that true? Can you give me an idea of the number of schools doing this? I hope you are exaggerating. Most of the UC campuses fall in the selective category. I plan to look into this issue in the future, but Algebra I in 8th grade is not the only path to take calculus by the end of high school. Some districts are making the acceleration point in 9th grade, by combining two years of Integrated Math as a 9th grade course. Their assumption is that 7th and 8th grade Common Core courses are rigorous and provide a sound basis for other options in high school. I’d welcome a discussion among math teachers on this approach. One can search on Phil Daro and the Common Core to find the opinion of one of the standard’s authors. He was also a voice for ending California’s goal of algebra in the 8th grade. He makes a personal judgment that about 10-15% of students are ready for acceleration before high school. At least I can only see it as a personal judgement as he does not claim any deeper support. Mr. Daro is on the record many times saying that slowing kids down is better than speeding them up. And since he’s chosen to use the term “social justice” in regards to the purpose of standards and the Common Core standards in particular, he’s gotten criticism for eliminating the achievement gap by the feared method of slowing down higher achievers. But at least he’s politically aware enough and careful enough that one cannot interpret his precise language in that manner. My personal judgement of his statements and the way in which he made those statements is that he really does support acceleration for the appropriate middle school students. I don’t know exactly what is going on in admissions today, but I think most schools that would fail to consider a kid who took four years of rigorous math courses and finished at precalculus instead of calculus (with strong grades) are shooting themselves in the foot. I also suspect that this population – kids who take four years of rigorous math and finish in precalculus – is probably relatively small today, because of the emphasis on 8th grade algebra in the current curriculum. I’ve said before (I’m not a teacher but I am a STEM graduate) that I think it’s probably more important that a student take math for four years than that they take algebra as an 8th grader. I suspect California universities will adapt to the curriculum change. Page 9 of the powerpoint survey summary states that 30 percent of the surveyed districts will not offer accelerated math pathways in middle school. We need to know the raw data underpinning that fact. How many of those 30 percent have been offering the opportunity for Algebra currently in 7th and 8th grades? How many of those 30 percent are K-8 districts vs. high school districts? How many of those 30 percent have had public hearings/discussion about the decision to prevent prepared students from acclerating, despite national and state Common Core recommendations to include acceleration paths? A family should not consider abandoning the public school system because public school will lead to reduced options for a prepared student to earn a future competitive college spot. There are many universities in the US that will not consider a student’s application for a math/science major if Calculus has not been successfully completed by the end of high school. That’s this generation’s reality. Preventing prepared public school children from enrolling in Algebra in 7th or 8th grade only will widen the opportunity gap between private school students and public school students. Unless the University of California will begin to admit students randomly, those students prevented from middle school algebra will be highly unlikely to bump accelerated kids from a limited number of STEM major spots. A family should not consider abandoning the public school system because public school will lead to reduced options for a prepared student to earn a future competitive college spot. Did you mean to say ‘not’?